A deputy who was working at Marjory Stoneman Douglas High School on Monday was caught sleeping in his patrol car. Now he's been suspended. A Broward County, Florida, sheriff's deputy was suspended Tuesday after he was caught sleeping on the job at the school where a shooter killed 17 people last month. Local media report a student found Deputy Moises Carotti asleep in his patrol car outside Marjory Stoneman Douglas High School on Monday. The student told another deputy on campus, who then woke Carotti. About half an hour before the student found Carotti asleep, deputies arrested the brother of suspected shooter Nikolas Cruz for trespassing on campus. Also on Tuesday, deputies removed three students from Stoneman Douglas, two for allegedly bringing weapons to school and a third for allegedly making threats online. Florida Gov. 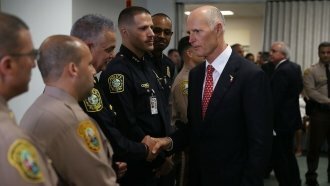 Rick Scott is calling for heightened security at the school, including an armed law enforcement officer at every entrance while students are on campus.